If you have a dog that has an accident or illness (often bone cancer or some other type of bone disease) that requires them having to have a leg amputated it can be extremely distressing for both you and your dog. Sometimes, even when amputation is being recommended as the best course of action, owners delay making a decision as they are worried it will change their dog’s personality or ruin their quality of life. With a little help and some minor adjustments though, your dog can go on to have just as full and happy a life as before the amputation. Adopting a three-legged dog, or Tripawd, as they are often referred to, can be a hugely rewarding experience too but, despite this, they often find themselves waiting for a home longer than their four-legged kennel mates. Should I Make Any Adjustments Around the Home? What and How Much Exercise Should a Tripawd Get? What Equipment Can Be Helpful For Tripawds? A study published by the Journal of the American Veterinary Medicine Association in 2015 reported that 91% of the owners involved did not perceive a change in their dog’s attitude after amputation. So you don’t have to worry about your dog becoming seriously depressed or having a more negative outlook as a result. We tend to anthropomorphize our dogs but they will not have the same psychological trauma that we as humans could have after amputation. 73% of those owners involved also reported that there was no significant change in their dog’s recreational activities. So they were still able to swim, play, be involved in a variety of dog sports. The most positive and revealing result for me is that 88% of those involved reported that their dog’s quality of life returned to what it was or almost as close to what it was prior to amputation. This tells us that we shouldn’t be worrying about a dog struggling with amputation. Their life can be fantastic if we give them a chance! While your dog will likely manage extremely well with life on three legs there can be an adjustment period where they have to learn to do things slightly differently than they previously would have. There are certain things you can do around the home to help them make this adjustment. Care should be taken around stairs initially. Most Tripawds learn to negotiate stairs very quickly and you may be surprised how efficiently they learn to zoom up and down them. At first though careful supervision is sensible and you might even want to consider using a baby gate to restrict unsupervised access initially until you are confident they have the knack of it. Any dog can sometimes have issues with smooth and slippery surfaces around the home and it can cause even more balance issues for Tripawd dogs. You may want to consider adding more rugs or runners to carpet free surfaces that your dog struggles to get traction on to help minimise the risk of them sliding. In your garden look out for uneven surfaces and holes, these can present a trip hazard for any dog but can be more of a risk for a three-legged dog. If your dog is used to being on the sofa or bed you will need to watch how your dog manages with this after amputation. Some dogs are fine getting up but can find it more tricky getting down. If this is the case you may want to provide aids to help like a little ramp or steps. It is really important that you continue to give your Tripawd plenty of exercise. Some people make the mistake of thinking that they should exercise their pet less and this not only means your dog could feel less stimulated and enriched, leading to behaviour problems, but it also means that your dog could lose their fitness and muscle definition and it is important that they retain this to help them function at their best on three legs. When they first have an amputation it is important that you build up their exercise again gradually. Shorter and more frequent walks would be better, allowing them plenty of opportunity to sniff can tire them out well. You should also consider the types of activity you are taking part in to make sure that you are not putting too much strain on their existing joints. Whilst they could still take part in agility, for example, you would need to consider the height of the jumps. Swimming can be a popular exercise for your dog if they like the water as this puts minimal strain on their joints. Dog obesity is a huge problem. We often make reference to a 2017 report from The Association for Pet Obesity Prevention (APOP) as it includes a statistic that really brings home just how devastating a problem there is. It states that an estimated 56% of dogs in North America are obese! Obesity for Tripawds, along with the usual problems it brings, can cause more problems as it puts a greater strain on the remaining joints. This is another reason why it is so important that your dog gets sufficient exercise and they should have a sensibly managed diet too. While Tripawds usually go on to live long and healthy lives there are health issues that can crop up that it is useful to be aware of. In the immediate period after surgery, some dogs can experience phantom pain from where the limb once was. They may stare at the space where the leg once was, try to lick the area, and there could be muscle twitching. Whilst this usually fades with time it can be confusing and distressing for your dog and it is also not nice for you to watch this occurring. It is always good to check in with your vet for advice but there are some other things that you can do to help. Be aware that some of these may not be appropriate whilst the surgery wound is still healing. Distraction techniques can work wonders. Give your dog some safe and appropriate interactive treat toys. If you can promote increased circulation through gentle stimulus this may also help the brain to rewire more quickly. Gentle massage techniques could help, mild exercise, and, if there is a stump, you could try gently covering or wrapping this in a towel or blanket. Sometimes the pressure of a snuggly fitting doggy t-shirt can also help, providing it is not irritating the wound and that you can get it on without it causing any pain to your dog. Good nail care is important for any dog but for Tripawds it is even more vital. If you neglect this and it causes a problem with one of their remaining legs then it can be very debilitating for them and greatly impact on their mobility. It is important to ensure that their nails are kept at an appropriate length. Overgrown nails can cause dogs to walk with an unnatural gait and this can put additional strain on their remaining limbs and it can also create balance issues. If they grow far too long they can start to curl back in on themselves and this can cause pain and possible infection. Read our article on best practice for nail trimming for further guidance on getting it right and making sure your dog is comfortable when it is being done. Three-legged dogs are at greater risk of developing arthritis because of the increased strain that is put on their remaining three limbs. You can help minimise that risk by keeping your dog at a healthy weight and making sure that they get enough appropriate exercise to keep them fit and supple but without putting unnecessary strain on them with excess high impact activity. It would also be worth speaking with your vet about using some joint supplements too. If you are going to get supplements outwith your vet practice then choosing something with Glucosamine and appropriate fish oils would be sensible. Nutramax Dasuquin Soft Chew Joint Supplements are a popular choice and Zesty Paws Salmon Oil is also well-reviewed. For more information on the science and regulations behind dog supplements please read our article on the topic. If your dog does start to develop signs of arthritis it is extremely important to consult with your vet so that they can help you provide the appropriate treatment plan and this may include pain management meds and alternative therapies like massage, hydrotherapy and acupuncture. An Elbow Hygroma is a canine pressure sore that can be common in large breed dogs. They look like a large callous but they can be much more serious than that as they are a fluid-filled sack that comes about as a result of a heavier dog’s elbows pressing down on hard surfaces when they are lying down. These can become infected if they are not dealt with and the infection can spread through the body quickly so it is a serious issue and not one to be dismissed lightly. Because Tripawds will often place more pressure on a particular side of their body when lying down this makes them even more susceptible to Elbow Hygroma, again particularly in the bigger dogs. It is really important to ensure that you invest in a good bed for your Tripawd and encourage them to sleep there if they don’t already sleep on your own high-quality memory foam mattress at night. There are also elbow pad protectors that are available for you to use with your dog and some people even have a go at making their own protection using packing foam. You may also want to consider getting your Tripawd some physical therapy sessions, this could be especially helpful after the surgery as it would allow you to get some guidance and help with building up muscle strength in a sensible way. It can work as a good form of low impact physical exercise and it can also help with pain management for things like arthritis. A traditional, qualified canine physiotherapist may give you some specific exercises to help with strengthening muscles and for promoting balance and they could also help with massage techniques too. Hydrotherapy, where your dog swims in a controlled environment with assistance, can also be useful as this is a very low impact form of exercise. Acupuncture is a popular alternative therapy for helping manage pain and this could be particularly useful if your dog is starting to show signs of arthritis. Some dogs will only have a partial leg amputation. In these cases some owners consider the viability of using a prosthetic to provide more balance, support and options in terms of activities. It can mean less strain on the other three joints, particularly when doing higher impact activity and this may help reduce the risk of joint problems going forward. It does have to be considered on a case by case basis. Prosthetics are most commonly used on front legs as this is where dogs put the bulk of their weight. Not every dog will tolerate wearing a prosthetics and they may prefer to be free of this sort of intervention and it can be an expensive exercise to try out. For dogs that have had an entire leg amputated, a prosthetic would not be an option as it needs to be attached to a stump. As well as appropriate exercise and adjustments around the home, getting your dog the right gear can also be helpful for Tripawds. Below are some of the items that you may want to consider. Having a comfortable sleeping place is important for any dog. For Tripawds, making sure that it provides the right support and that it is in an easily accessible space is even more crucial. As mentioned earlier, three-legged dogs place the pressure on their bodies more unevenly and this also applies when they are lying down. Not only can this put more pressure on the joints but it can put them at increased risk of the swelling of the elbow joint we talked about, Elbow Hygroma. This problem is a greater risk for large breed Tripawds too as the weight they have to bear is more than the little dogs. By picking a high-quality orthopaedic bed that will mould to the contours of your dog’s body, you will be relieving any pressure and helping to promote maximum comfort. If your dog always gravitates to the floor you may need to spend some time working on rewarding them every time they go to their new bed and, as they associate it with good things, they should learn to go there automatically. If your dog sleeps on your bed, providing their movement is not restricted and that the bed is also very supportive this should be fine but you may need to provide steps or ramps to help them get down from a very elevated bed. The Big Barker Pillow Top Orthopedic Bed could be a good option for those large breed dogs. Sometimes standard beds are not roomy enough for the biggest breeds. This provides great support and it is also big enough for large breed dogs to get comfy without hanging off the edges or having to squeeze into it. To help your Tripawd stay well balanced and to minimise any potential stress on their joints, especially if your dog is a bigger size, then you may want to consider using raised feeders. This means that when your dog is eating and drinking the bowls are at a height that allows them to reach the bowls without leaning down. There are lots of different options on the market. 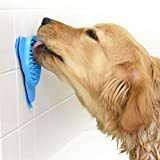 Some of it comes down to personal preference in terms of style but you should also make sure that you pick one that can stand at the right height for your dog (some are adjustable) and that will not slip around on the floor and that has appropriate bowl sizes. The Pet Zone Elevated Feeder is a popular choice, is not too expensive and can be adjusted to 3 different heights. If you want to provide extra balance and support for your three-legged dog or if they pull on the leash and you want to take the strain away from their neck area then a harness is recommended. Not all harnesses work well on a Tripawd though, especially if they are missing a front leg, as the harness often needs to have both front legs to hold it in place properly to prevent it sitting awkwardly or having the dog slip out of it. There are a couple of harnesses that are often recommended as being a good choice for three-legged dogs. 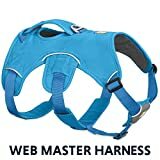 Okay, so the Ruffwear Webmaster Harness is probably one of the most expensive harnesses on the market but it could be a really worthwhile investment. The harness is often used by outdoor enthusiasts that take their dogs climbing with them. The extra support that the harness provides means that they can belay the dog for short periods in an emergency. It can work really well for front and rear leg dog amputees because of the multiple support sections across the body. The fact that it is so supportive is also good if your dog needs a little extra assistance with balance, particularly in the immediate days after surgery. 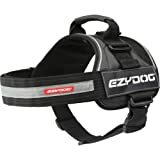 Unlike the Webmaster Harness, the Ezydog Convert Harness is just designed as a walking harness rather than to provide additional balance support. The front chest strap means that it will not slip off the body where the limb is missing. It also has a very wide chest strap so this means that it is very supportive and, providing it fits well and sits correctly it will provide a comfortable fit. As with any dog, it is important to keep your three-legged dog well-exercised and appropriately enriched in the home too. We are advocates of using safe interactive treat toys. They can be very useful for keeping your dog stimulated, helping them to settle or to use as a distraction or a redirection. Some toys are designed to move around and some are designed to be held between the paws for stationary attention. These stationary toys can be particularly useful if you want your dog to settle somewhere. This might be in a crate, if you are visiting a cafe or someone else’s house, in between rounds at a training session or dog sport competition or whilst you have visitors in your own house or if you are trying to keep them occupied whilst you are out. 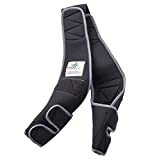 Crucially, these can also be really helpful during the post-amputation period when you need to keep your dog calm, relaxed and on restricted exercise to allow the wound to heal. These types of toys can sometimes be challenging for Tripawds, especially those missing a front leg as they can’t get a good grip. There are certain options though that will still work well stationary but without your dog having to grip the toy. Snuffle Mats are usually made of lots of strips of felt material that are tied to a rubber mat. 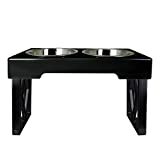 This is then used to sprinkle food or treats through and it can keep your dog entertained trying to find the treats. It satisfies your dog’s natural desire to sniff and it is mentally enriching. It can also be good for three-legged dogs as they are able to work to get the treats without having to hold the item in place with their paws. If your three-legged dog has balance issues when a treat toy is on the floor or if you want to minimise the strain on the joints, you could pick a toy that can be attached to wall tiles or some other suitable surface. The Aquapaw Slow Treater is one such option. It can be smeared with peanut butter, bananas or some other suitable soft treat or wet food. This is not an indestructible toy though and you should always supervise your dog if they are likely to chew on it. If you have slippery surfaces in your house it can make it more tricky for a Tripawd to keep their balance. You may want to put down more runners and mats to help them keep their stability but you could also consider using a pair of boots or applying Paw Wax. The Mushers Secret Paw Wax is one of the most widely recommended brands available. For some Tripawds, particularly those with front leg amputations, getting down from a raised surface can be a bit more tricky and it can also put more strain on their joints. 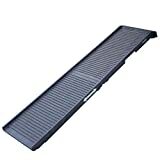 If you let your dog sleep on your bed or get up on the sofa then you may want to consider using a set of doggy stairs or ramp to help them get up and down easily, particularly if they are a small dog. You may also want to use a ramp for helping them get in and out of the car. Having to lift a large breed dog up into a high vehicle can also be challenging for you.